The school is the second building in the city to get solar panels as part of the UK’s largest community-owned urban solar farm – and is the first to be producing continuous power to the grid. The scheme, which was launched last autumn, successfully raised nearly £1.5 million from members of the public to put panels up on up to 25 buildings owned by the City of Edinburgh Council – with future profits pledged to community projects across the capital. 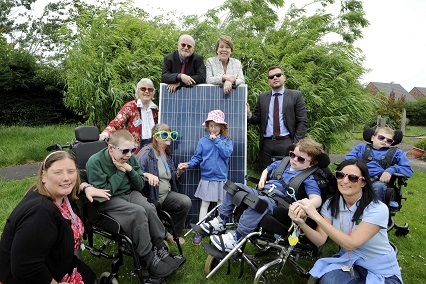 Solar co-op chair Richard Dixon and Councillor Lesley Hinds were both on hand to celebrate the panels going live, along with co-op board member Johanna Carrie and pupils from the school. “This is a tremendous milestone for the scheme and meets our dual ambitions of generating green energy and a new income stream for the benefit of community projects. “Oaklands School forms part of a programme that will be rolled out throughout the summer with completion planned for September. “This is a fantastic project and I’m delighted to see Oaklands as one of the first to gain from it, and the many environmental and economic benefits solar energy can bring. “Communities across Scotland have turned to renewable energy for a variety of very practical reasons: saving money, as well as reducing the carbon emissions which lead to climate change and, on some remote islands, providing heat and light for their homes.